It is clear to most people that many events require a blade that’s sharper than an average kitchen knife. These situations require cutting rope or a stuck seatbelt to save trapped people to warding off an attacker in a self-defense situation. These situations require a tactical knife. The modern tactical knife is designed for a broader range of uses than just as a bayonet or as a fighting knife, and is designed for maximum versatility. 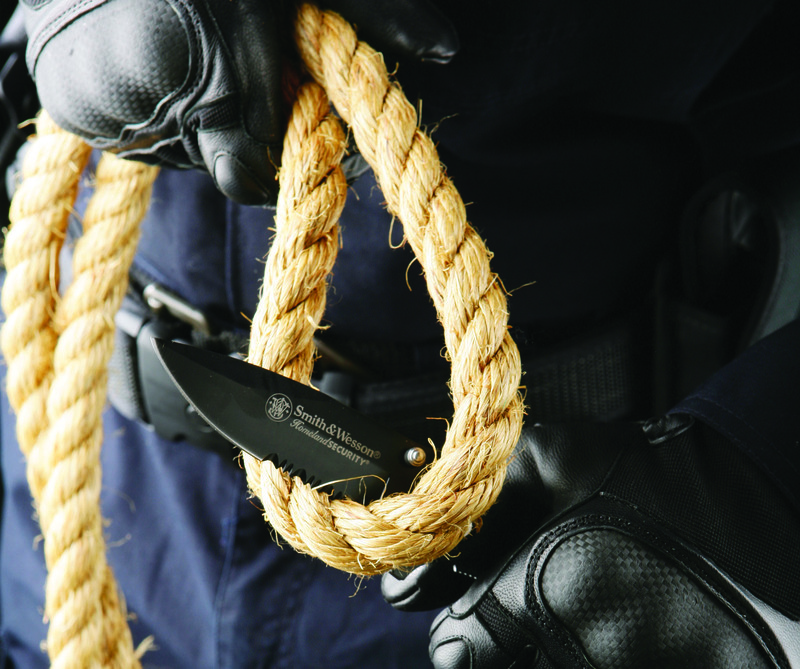 Tactical knives are useful in many different situations, especially for those in military or law enforcement. There exist a wide variety of brands such as 5.11 Tactical, BLACKHAWK!, SOG and Smith & Wesson and each model of knife has its own particular features. Below is a list of some of the most important features to look out for when purchasing a tactical knife. Knives are usually constructed of two types of steel: stainless steel and carbon. The main difference being that stainless steel has more chromium than carbon steel. The benefit of stainless steel is the resistance to wear and tear compared to carbon blades. It’s also resistant to rust and water damage, and is typically easy to sharpen. Carbon blades, on the other hand, are tougher than stainless steel, but they are highly vulnerable to rust damage. They are also more difficult to sharpen but they don’t dull nearly as easily. You need to have a good grip to prevent the knife from slipping from your hands at the time when you really need it. There are three main types of grips: textured/checkered handles, rubber grips and cord. Textured or checkered handles provide you with a good grip and are the most durable option since they are crafted into the handle instead of being attached to it. Rubber grips can provide you with a better traction than textured/checkered handle, but rubber grips are easily damaged with wear and tear. This is because it is attached to handle instead of being crafted into handle, which means it can dislocate. Cord allows you to have a good grip in wet conditions unlike rubber which gets makes it more slippery. A good handle is essential for a knife because after it’s where you grip the knife. In a survival or self-defense situation you don’t want it to break when you apply too much force. It must feel comfortable and handle the stress. There should not be any pinching points, sharp corners or an unnatural feel to the handle. It should feel that way in both a forward grip (where the blade coming out of the top of your closed fist) and in a reverse grip (where the blade coming out the bottom of your closed fist). Watch out for over-pronounced finger grooves, which will force your hand into a predetermined position. Tactical knives are available in many different sizes and it depends upon what kind of blade you are looking for. Most people prefer EDC (Everyday Carry) knives so that they can fit easily in their pockets and purses. For this purpose it is beneficial to choose a folding knife, which can easily be stored in a compartment or pocket. The most important factor that one should worry about when purchasing folding knife is about the quality of the knife hinge in the locking mechanism. On the other hand, a fixed blade knife may be larger in size but it is more likely that it will last longer than a folding knife. So depending on why you want a tactical knife, you may find either a folding or fixed knife to suit your purposes better. Tactical knives come in a wide range of shapes and weights. A smaller knife feels nearly weightless, while the larger knives can weigh more than half a pound. Almost all of a knife’s weight is found in the blade, which means that you would choose a lighter blade for day-to-day tasks and a heavier one for more intense tasks. No knife is going to be perfect for every scenario, so it’s best to either choose a middle ground or keep multiple knives on hand and choose which to use on a case-by case-basis. There is no perfect knife for every situation, unfortunately. Everything from the material of the blade to the size of the knife depends entirely on what you will be using it for most. However, with these important features outlined you should feel well equipped to purchase a versatile and trustworthy tactical knife.